Christine Gritmon talks Getting Rid of Fear and ROCKING IT! An episode of What’s Your Something? This show exists to help you kick fear to the curb, boost your confidence, and BOLDY tell your UNIQUE story online. So it’s Tuesday. Totally thought I hit publish yesterday. (Oh well!) This is an amazing episode where Ai shares with us her story of self awareness and Looking Within. It doesn’t matter what the schedule is of your podcast, if you’re not consistent, you won’t see any results. You know, sometimes it’s easy to think why did this happen in my business or why ISN’T this happening in my business. But Stacey shares with us that we must not view failure as failure. We must see it as lessons and have no regrets! Today I wanted to share with you where I have been, what I’m up to, and where I’m going. Ted is on the show today, and he shares his story and doesn’t hold back. You don’t want to miss him share about #RonR and even some more personal things as well! You’ll definitely be inspired by this episode. What To Do When You Don't Know Your Something? There’s Just One Thing Missing - YOU! Podcasting can be a lonely world, but it doesn’t have to be. Today, I issue a challenge for you to submit in your questions, praises, dislikes, even anger into the show. Listen to see how to take part! Social Media Day Houston was a blast!! I learned so much about Facebook ads, content calendars, live streaming, and practical advice for growing a business! It was amazing! Some sad things have happened in the social media space the past few days. My heart is just broken over it. At the end of the day, please be yourself. On and off social media. Don’t change who you are off of social media! Mike Allton - Be Flexible. Everything Can Change! My chat with Mike was amazing. We reminisced about the days of Google+ and how you must be willing to be flexible and be willing to pivot, because everything can change just like that! Coming home from Social Media Day Houston, and I AM TIRED! But, I have to keep pushing through! What I Know, So Far, About #IGTV! Today I wanted to share with you some AWESOME stuff I know about IGTV so far. Do not pay attention to vanity metrics. Keep up the good work, out your blinders on, and TELL YOUR STORY! People will give you opinions all day long, but don't listen to all of them. Yes listen to people, if they are being helpful then hear them out, but if they are wanting to CHANGE the way you do you, then ignore. #RoadToSocial has given me some major "M.O. (Missing Out)". I have GOALS, and YOU need goals as well! Batch Your Content, Daily Goes By FAST! Yeah. If you are going to attempt daily content, DEFINITELY batch create it. Otherwise, the days slide past you! When it comes down to it, whatever you’re something is in life, you need to make sure you’re happy. Scott shares his story of how he remains happy as well as all of the awesome things he does with AgoraPulse! If you want to BOLDLY tell your story online, then you need a hub. A website will give you an OWNED space to tell your story. All It Takes Is One! Don't give up if you aren't seeing the results you would like to see. Keep going! You never know when your "one" is right around the corner! This episode was recorded as a video on #IGTV! I talk about all the fun I had at Social Media Week Lima, as well as the #IGTV announcement. Jessika Phillips - Relationships MATTER! Jessika Phillips is founder of NOW Marketing Group and Social Media Week Lima and she is ALL about relationship. Relationships MATTER! Times will come in your journey where the fear will return. What do you do during those times? Melissa Reyes says you know you’re on the right track when it feels like falling in love! Fear is crippling. Trust me I know. Today I want to give you three things you can do right away to help kick fear to the curb! There’s Interest In YOUR Something! You may think that your something doesn’t matter. That no one will care about your passions like you do. Well, I’m here to tell ya, if there’s a museum completely dedicated to Bigfoot, then you can make a business out of your passion. We’re over a month into the podcast now, and today, I want to share with you seven things I learned starting and launching a podcast. When you're passionate about something, you should give yourself the liberty to ENJOY yourself and have FUN! Loosen Up folks! When I went to publish yesterday's podcast and share about it on my Instagram story, I realized Instagram was down! This reminded me that platforms aren't guaranteed to be around forever. Focus on what you control! I’m excited to announce that we’re going daily! It’s gonna be hard, but if you want to get your story out there, you have to be consistent and put in the work! Today’s episode with Gary Cantrell, reminds us that Hard Work ALWAYS wins! Listen in to hear his journey of weight loss, as well as his podcast and apparel line! My heart is in this episode y’all! I give you some #RealTalk as I share why I am an entrepreneur. It comes down to this. Don’t be ashamed of where you are in your journey. Kevin Touch - Wise Beyond His Years, and ROCKIN’ IT! I was just stunned when I interviewed Kevin. He's 19 y'all! In all seriousness, Kevin is the host of the Anchor Nation podcast, and just provides TONS of value, and truly CARES about his community! Watch out world, Kevin is CHARGING through! No excuses folks!!! On today’s episode, I share why I believe now is the best time to take action in business! Amber is 100% all about community. She shares with us how she has built her community and how she nurtures it even through the hard times. We might even talk a little bit about her dating life haha! After reading a lot of Gary Vee's stuff, I am learning that I need to do more documenting than creating. In this quick, digestable episode, I give you some encouragement to simply do it. To simply tell your story. To kick fear to the curb, and boldly share what's on your mind! Troy shares with us his AMAZING story of how he got to where he is today, and how he pushed through some TOUGH stuff to get there! This guy is the hardest workaholic you've probably never heard of. It's amazing the communities that Madalyn has built! She started out building "Go Girls Music" and made the huge pivot to where she is now, top social media influencer and host of the #TwitterSmarter podcast and Twitter chat. But that's not all, she's also built a community around the Twitter chat #SocialROI, and co-hosted the "Communities that Convert" podcast! She's got a lot on her plate and she is ROCKING IT! We all experience good times and hard times in business. Chelsea reminds us that there's a reason for everything! She understands that she's going to learn something in every situation she's placed in as a business owner! We can definitely learn from her! Todd Bergin talks About The FREEDOM of Time! There's one thing so amazing about being an entrepreneur, and that is you have the FREEDOM of time! You're able to plan your days the way that you see fit. Todd shares this with us and so much more! Sara shares with us about having a good mind set, and providing your clients with Case Studies of your hard work paid off. JoAnn loves people! She understands that building relationships is key to building authentic community and a successful business. Bree Palmer talks About Doing What You Love! Bree Palmer, author/podcaster of "The Amazing Human Series" talks about how at the end of the day you have to do what you love! Don't stress over things you're not good at, and focus on your strengths! Christine Gritmon, small business owner of Christine Gritmon Inc., talks about getting rid of fear and just rocking it! Katie Miller talks About the Need for More Love! Katie shares with us her journey so far as an entrepreneur. Biggest key, LOVE people, LOVE! Brian Fanzo, better known as iSocialFanz, shares with us the great NEED for self-awareness, and to NEVER accept failure! Chris Strub, self proclaimed "Road-Trip Marketer", shares with us some great advice about being confident in your story, and committing to your story! 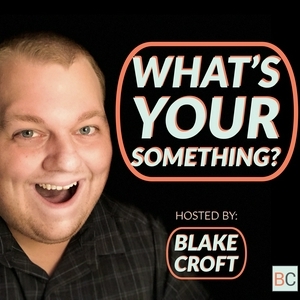 Blake Croft Introduces "What's Your Something?" Our host Blake Croft, shares his story with you and introduces the podcast "What's Your Something? ".